And once again it appears that I have failed to get one of these (or two rather!) out on time. The first couple of weeks in May were pretty tight since I was both working on edits for the novella while also working on the prequel short story, so that never happened. And once again, I just go too lazy last weekend to work on this. Weekdays just aren’t that good for me generally to do one of these things. Takes too much time. But can’t putit off forever, either, so here it is. Lots has happened in the last couple months and this is how the writing and reading went down in both April and May. You can find the March Report here. Just a quick update on things before I post my monthly report for last month later this weekend. Its been a somewhat hectic couple weeks, and I haven’t been able to collate all my writing data as yet. 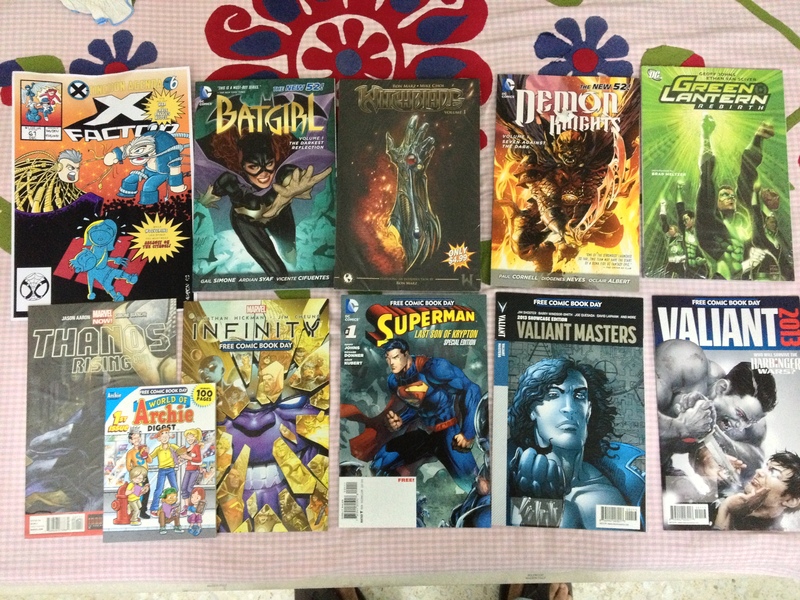 This past weekend was my first Free Comic Book Day, or FCBD for short. It is a global event and comics publishers all over put out a handful of comics that are free of cost for readers. Print or digital, they are absolutely free (the stores still have to pay though, so keep that in mind!). All I can honestly say is that it was a downright blast, at least as long as we don’t consider my Iron Man 3 experience on the same day, something that is best left to my review, which I’m hoping to get done this weekend. My local bookstore of choice had a fair range of titles on offer by the time I got there, although they had already sold out on a few I had really been looking forward to, such as IDW’s Teenage Mutant Ninja Turtles, Dark Horse’s Star Wars, Top Cow’s Aphrodite, and 2000 AD’s Judge Dredd. Pretty gutted really, but I did manage to pick up a few interesting titles, one of which happens to be an Archie’s Digest, a comic I have not read in YEARS. Possibly an entire decade at the least! Here are the books that I picked up this weekend, including a couple trades for graphic novels that I’ve had a blast reading in digital. Money well-spent as far as I am concerned. Left to right, that’s an X-Men spoof poster by somebody someone, Batgirl Volume 1 by Gail Simone, Witchblade Volume 1 by Ron Marz, Demon Knights Volume 1 by Paul Cornell , Green Lantern: Rebirth by Geoff Johns, Thanos Rising #1 by Jason Aaron, FCBD: A World of Archie’s Digest, FCBD: Marvel Infinity by Jonathan Hickman, FCBD: Superman #1 by Geoff Johns, FCBD: Valiant Masters, and FCBD: Valiant 2013. Lots of fun titles those. For those interested, you can check out my review of Batgirl Volume 1 here, and the one for Green Lantern: Rebirth here. Now, on to other things. I finished the second-pass edits on Dharmayoddha last month and sent the novella out to a few beta-readers. Response has begun trickling in and so far its all been quite positive, with a few minor niggles here and there. I am pretty confident of the project now. This is, I think, just the right boost that I needed, and I can’t wait to hear back from everybody, and then begin the third-pass edits, fine-tuning things as and where they need to be, and there are few for sure, no doubts about that. Also, I just finished the prequel story to Dharmayoddha, tentatively titled Dharmasankat: Crisis of Faith. It clocks in at 5,130 words exactly and I’m really glad that I finally got it done. The short story is intended for the Manifesto UF anthology by Tim Marquitz, and the submissions window for that closes on the 15th. I’m hoping that I can get it polished in time for the deadline, but the fear niggles that I left this off too long, and that it might not be ready. If it is not, well, then, I can consider other avenues. Hopefully. We’ll see how that pans out. But now, I’m pretty damn excited, being in a really good place with my writing.